Note: Video will be posted as soon as it is available at the Consortium News website. Other speakers at the event included Sam Parry (Robert’s son), Norman Solomon, Dennis Bernstein, Ann Wright, and Consortium’s new editor, Joe Lauria. I’d like to thank everyone for coming today. I’d also like to thank the organizers for inviting me to speak at the tribute to a man who was very inspirational to me. My own interest in foreign affairs began in college. Not long after I graduated, 9/11 happened. I joined the local peace movement to oppose our post-9/11 wars. It didn’t take long for me to realize that the media is a big part of the problem. The myth we’re taught is that our democracy is underpinned by a media that serves as a watchdog on the government and other powerful institutions – a noble fourth estate. But when it comes to issues of war and peace, the media rarely – if ever- serves as a questioner of government claims, performing due diligence on a matter of life, death and destruction of societies. We saw the mainstream media’s gross negligence with Iraq, Libya and other examples stretching much further back. We are now seeing the same thing happen with the world’s other nuclear superpower, Russia. I grew increasingly concerned about the degree of recklessness by U.S. political elites who supported the coup in Kiev – completely disregarding Russia’s security interests on its border. I began to dig deeper into post-Soviet Russia and U.S.-Russia relations. I realized just how distorted and lacking in context the narrative Americans were being given was. During this time, one of the sources I relied on, among others, was Robert Parry and Consortium News. I also connected up with Sharon Tennison – an independent writer and program coordinator with over 3 decades of experience on the ground all over Russia, including citizen to citizen diplomacy during Cold War I. She became my mentor and we traveled to Russia in October of 2015 for two weeks where I was able to speak to a cross-section of Russians in several different cities on a range of issues. We traveled to Crimea where I interviewed a range of Crimeans about what happened in late 2013 and early 2014. At this point, I had researched and co-authored a book about the Ukraine crisis – providing historical and contextual background of U.S.-Russia relations, as well as writing articles for a couple of alternative outlets. I tried submitting articles about my on the ground observations and interviews in Crimea to several other “alternative” outlets in the hopes of getting this information out to a wider audience. After all, not many American writers had actually been to Crimea and could provide on-the-ground perspectives. But I was having little luck. Somehow I got hold of Robert Parry’s email address and submitted to him. Within 48 hours my article was posted, with many others to follow. I was even more pleasantly surprised when a couple of weeks later I received a check in the mail for my work – which is a big deal for independent writers these days. The money I earned from my articles at Consortium helped finance a return trip to Russia in 2017 and more articles. Bob said that journalism required the acknowledgment that there were usually 2 sides – and possibly more – to every story and that Americans needed to hear both sides. It’s critical to have an informed citizenry with a reasonable understanding of issues in a democracy. This is especially true with issues most average Americans don’t have practical experience with, such as international policies, policy relating to other countries. In order to conduct a rational foreign policy, one must understand the other country’s point of view – it doesn’t mean one must agree with it, but we must know how the other side perceives its own interests so we can determine what they may be willing to risk or sacrifice on behalf of those perceived interests. Further, it’s essential to determine areas of common interest and cooperation. Understanding that viewpoint means understanding the other side’s history, geography and culture. The MSM has not provided this crucial service or provided a platform for those who can with respect to Iraq, Libya and many of the other nations with whom we’ve gone to war. The so-called experts they consult often have conflicts of interest, nefarious agendas, and often lack an objective understanding of the nation about which they are writing or talking. This has certainly been the case when it comes to reporting on Russia – a country with which the stakes are potentially much higher. One source of mine who has spoken to State Dept. personnel in the recent past about their experience and expertise on Russia said that these diplomats admitted that they had been shuttled around to different countries in different regions – from Latin America to east Asia – before landing at their Russia post where they were suddenly expected to work and make decisions regarding that country with no knowledge of its history, traditions or culture. This is also true with mainstream journalists who cover Russia. 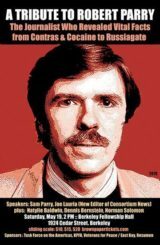 Robert Parry referred to these phenomena as careerism and groupthink. He argued that it was ruining journalism and the important role it’s supposed to play in our democracy. And there are examples everywhere. When our most experienced academic expert on Russia, Stephen Cohen, can hardly get an interview on CNN and cannot get an op-ed published by NYT or WaPo, but a neocon ideologue like Michael Weiss – who has no on the ground experience or educational credentials about Russia – can be hired as a commentator by CNN on the subject – it’s not just sad, it’s dangerous. When someone like Rachael Maddow – who we know from her past investigative reporting knows better – has allowed herself to be used as a cartoonish purveyor of anti-Russia propaganda while virtually ignoring coverage of more immediate issues facing average Americans and distracting them away from confronting the Democratic Party’s failures and dishonesty, it’s dangerous. Our media, like our political system, is in deep crisis. Indeed these two crises reinforce each other as both our media and our political system are corrupted by money and have been largely reduced to cheap spectacle. According to polls, large majorities of Millenials have contempt for these establishment institutions. They are open to and looking for alternatives to these broken systems. This makes Robert Parry’s legacy and the space for genuine investigative journalism that he fostered at Consortium News more important than ever. With strong leadership and the continued quality of long form journalism from its current and new contributors, we can make a much needed difference at this critical time.